IF YOU MISSED LECTURES AND ARE INTERESTED IN HAVING THEM PRESENTED AGAIN, SUBMIT THE FORMS BELOW. IF ENOUGH PEOPLE INDICATE AN INTEREST, WE MAY BE ABLE TO REPEAT LECTURES. Cuba is a land of incredible natural beauty with over 300 beaches, fine white sand and crystal clear water. The country is a fascinating mix of people, politics, food and the arts. Havana, the capital city, has some of the most extraordinary architecture in the world. The Cuban people are a delight! 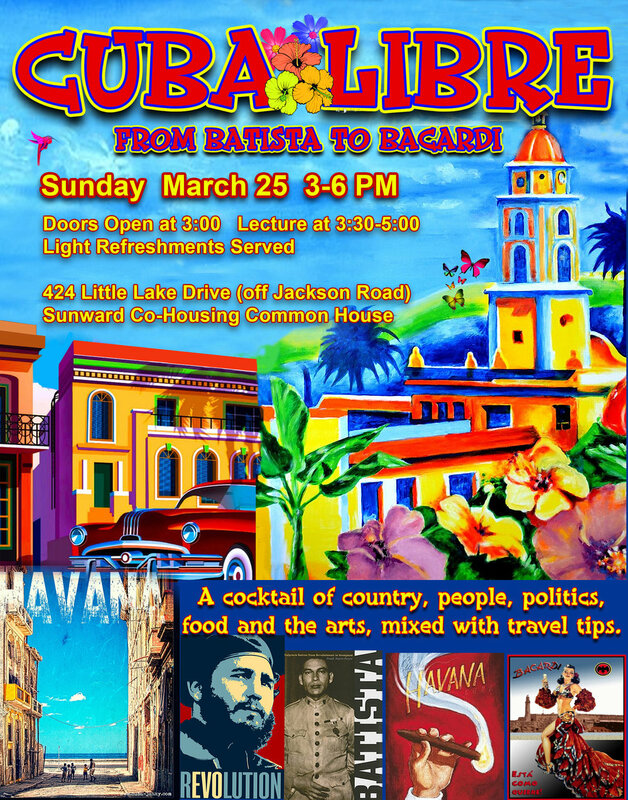 Two trips, (2002 and 2017) are the basis for this talk which will introduce you to Cuban history through sites to visit. The talk will be peppered with travel tips on how you too, can make a legal and successful trip to this paradise! It was the 25th anniversary of the fall of the Berlin Wall (November 9, 1989) and North Korea, pretty much the last full-fledged communist country save Cuba or westernized China, is alive and kicking. Having lived in the DDR (East Germany) for 25 years, I had to see what North Korea was like and how it compared to life in the DDR? Does a trip like this bring back long-lost memories? I went to North Korea, and it does compare and it did bring back memories. Join me as I explore some of the fascinating similarities and differences between these two regimes. You will be surprised to discover the connections that the design and construction of the arch have to Michigan. Its world famous architect died in the UM Hospital in Ann Arbor...his father shared a vision with the famous Michigan architect Albert Kahn... and more. We will look at some of the Cranbrook architecture by Eliel Saarinen and his son Eero, the winner of the design contest for the St. Louis Arch. We will explore the connection with the Arts and Crafts movement in Detroit, some of the buildings associated with this movement, and the beautiful Pewabic Pottery run at the time by Mary Chase Perry Stratton and still currently an open studio in Detroit. Elisabeth delivered the keynote address at the LAND (Liberal Arts Network for Development) Conference on February 7th. The topic of her talk was The Power of Movement. Please click on the link to the LAND conference website for more information. 34th Annual LAND Conference 2019 Theme: Movement. The 2019 LAND Conference was held February 6-8, 2019 at the The Kensington Hotel in Ann Arbor, Michigan.